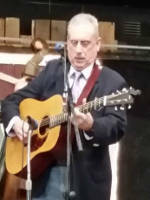 Gary Kelly plays guitar and sings lead. Gary ‘s playing is very aggressive and his lead singing shows respect for the masters, yet is all his own. 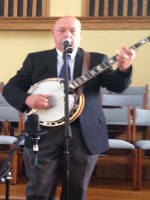 Rob Mitchum plays mandolin with the group. Rob started out in classical music with the mandolin, playing in an orchestral setting with the Louisville Mandolin Orchestra. 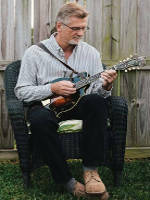 His love for bluegrass music has always been there early on listening and learning to old recordings, and sitting in on jam sessions until recent years bringing that music to the forefront of his playing. 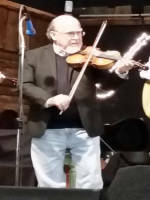 Mick Savkovich plays fiddle and sings . Mick started learning the violin when he was 10 years old. He discovered the “fiddle” while in the Army. He’s been fiddling around ever since! And loving every minute! 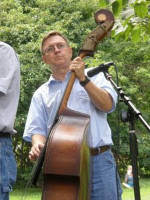 Doug Taylor plays upright bass and sings baritone with Fresh Cut Grass. His playing is rock solid and his baritone vocals blend in well with the total group sound.